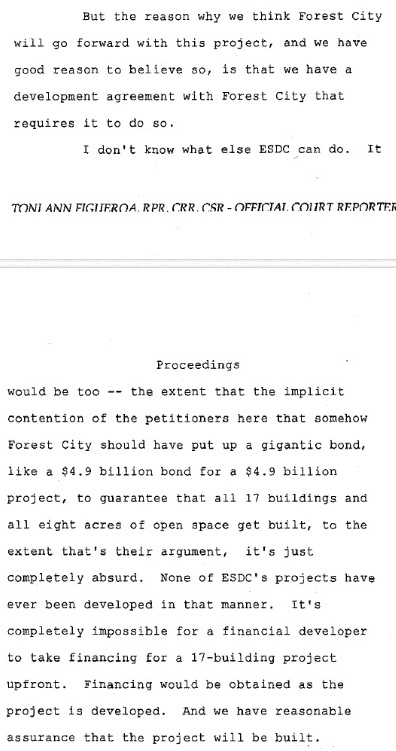 How the appellate court, in its way, backed up Lupica: "It was a hustle in broad daylight by Caring Bruce Ratner from the start"
The hustle wouldn't have worked without help from Ratner's partner in government, the Empire State Development Corporation, aka Empire State Development (ESD), which had recently completed a clever, devious move, withholding the Development Agreement for Atlantic Yards, thus obscuring the project timetable. 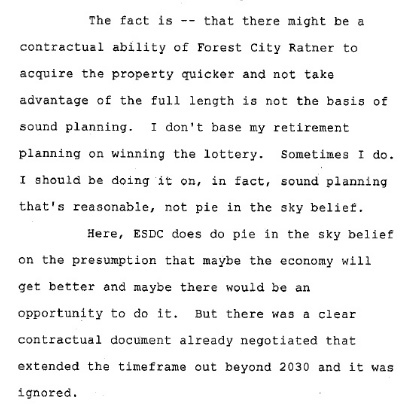 Now the ESD, courts have said definitively, chose expediency over candor, in order to get Atlantic Yards re-approved in 2009 and to enable that groundbreaking. However little the decision may change things on the ground, it's a moral victory and an important message about honest government and the lack thereof. That's news, though not everyone thinks so. So here's a round-up of the press coverage, so far of the appellate court's unanimous ruling regarding the state's failure to study the impact of a 25-year project buildout, a failure abetted by the withholding of the Development Agreement. As the headlines suggest, some articles drily focused on process, the court decision. Others, including my own, emphasized the meaning of the decision, the fact that the state agency in charge of economic development in New York misled the public. Patch: Appellate Court Orders Additional Review for Atlantic Yards Project: Rebukes state for approving extension on construction from 10 to 25 years without studying how change will affect area residents. Where was the New York Times? It whiffed. (No, The Local doesn't count.) But the Times's City Room blog yesterday devoted nine paragraphs to the departure of Public Advocate Bill de Blasio's communications aide. That's a consequence of the beat system, where a reporter has responsibility for specific subjects, and a sign that Atlantic Yards remains pretty much an orphan. Times editors of course can focus their staff; in January 2010, the Times spent more than 700 words in print to cover a Nets promotional visit in Brooklyn. My prediction: news of this important ruling will be folded into a round-up article about the arena's progress and lingering concerns (parking, liquor license, etc. ), just as the Times did last June in response to the lower court's ruling in this case. There's nothing on the Daily News website either, though sometimes they're print first. The newspaper does have a two-byline article on a gourmet mayonnaise store on Vanderbilt Avenue in Prospect Heights, just a few strides from the "blighted" Atlantic Yards footprint above Dean Street. The New York Observer, which once paid serious attention to Atlantic Yards, is also whiffing, at least so far. “The ruling represents a moral victory, if not necessarily an instrumental one; ESD surely will re-approve the project and issue a study, already begun (as a hedge) that likely will find few significant new impacts,” Oder wrote on Atlantic Yards Report. But Develop Don’t Destroy Brooklyn, one of the petitioners, suggests that elected officials change course, and bring in additional developers to develop the 22-acre site. DDDB's goal is possible, but unlikely, given that Gov. Andrew Cuomo has shown no sign of reforming the agency he inherited, at least regarding Atlantic Yards. Still, perhaps the study will show more candor than I first suspected. However, a moral victory is significant unto itself. Atlantic Yards critics and opponents have long said the process behind the project looked fishy. Two courts have confirmed that. The ruling yesterday was unanimous. 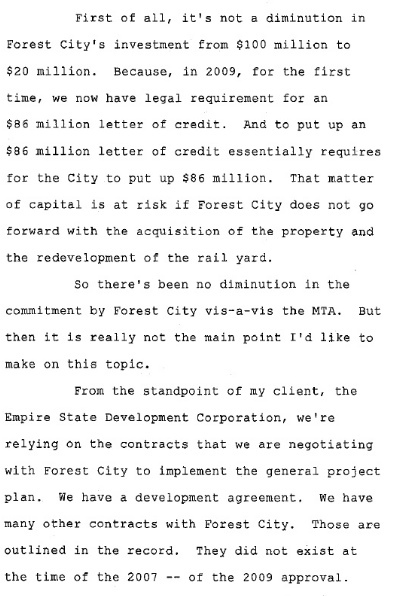 This was business, man, and most of the key ESDC staffers in charge of Atlantic Yards when the Development Agreement was withheld--remember attorneys Steve Matlin and Anita Laremont?--have safely retired. Cuomo could apologize. It wasn't his fault. He inherited this after his election in 2010. But he's shown no such inclination. But he wants to go to an arena ribbon-cutting too, right? It's good television. The timetable for the project would be enforced by the Atlantic Yards master closing documents, including the Development Agreement, which were signed in December 2009. 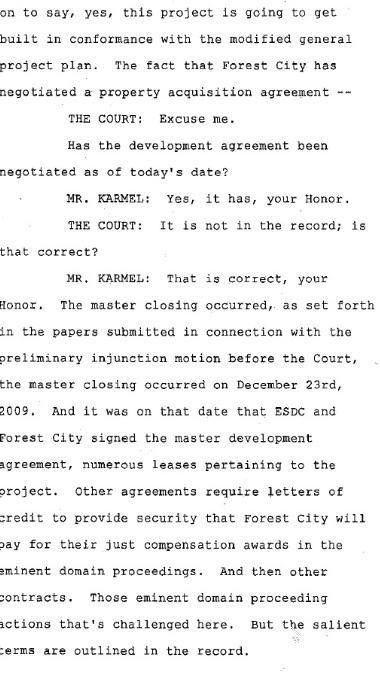 But those documents weren't released until 1/25/10, six days after the first hearing in this case was heard in court. 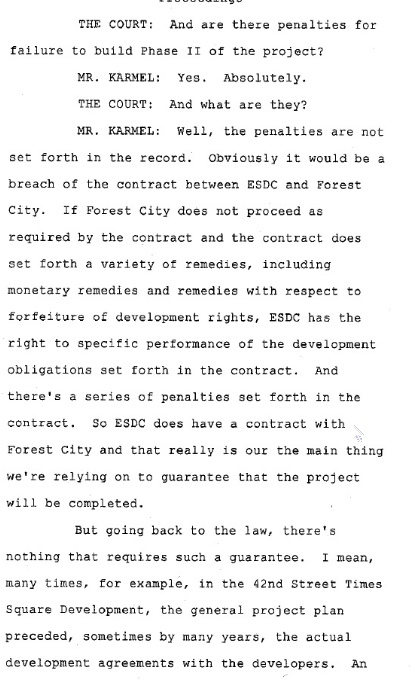 As Develop Don't Destroy Brooklyn's Candace Carpenter said yesterday, "The tragedy here is, but for the blatant misrepresentations to the Court by Forest City Ratner and ESDC, it would been determined in 2010 that an SEIS was required and that would have stopped construction of Barclays Arena." The case was initially argued 1/19/10. She rejected those finding, and the appellate court agreed. It's just taken well over two years. Where would we be if the Development Agreement had been released on time? 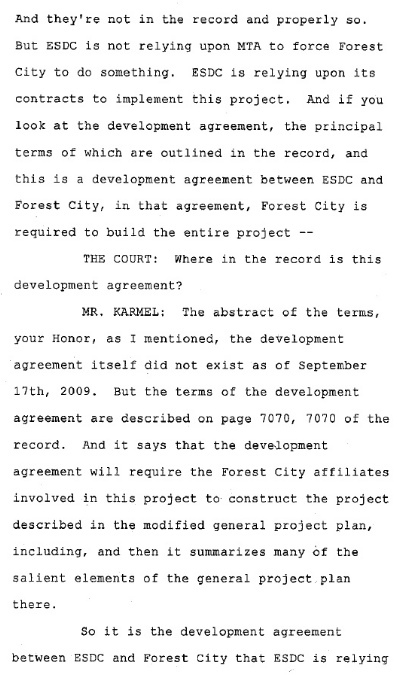 The discussion begins on page 222 of the document below, but I've excerpted the key passages from ESDC lawyer Philip Karmel, who said "we're relying on the contracts that we are negotiating," a statement the implies they were not settled, though he then said, "We have a Development Agreement." The principal terms of the agreement, he said, were outlined in the record. They weren't, because no one knew how light the penalties were. "Well, the penalties are not set forth in the record," Karmel admitted. That's where, in retrospect, the court should have stepped in.